Depending on how many trailers you saw, you were able to discern a fair amount of plot. Perhaps Paramount was worried about box office returns and were willing to reveal too much in their marketing push. It’s rather unfortunate that the trailers revealed the destruction of the Enterprise, but it does happen within the first half hour. When answering a distress call inside an uncharted nebula, the Enterprise is attacked by a swarm of small ships. The crew attempt a saucer separation, but there’s too much damage and the saucer falls towards the planet. Captain Kirk gives the order to abandon ship. The crew spends the majority of the second act on the planet. Most have been captured by Krall, who controls the swarm that attacked by the ship. He’s played by Idris Elba, another well known actor to play a Trek villain, and the first to be put through heavy makeup. If I didn’t know he was cast in the film, I wouldn’t have been able to recognize him. He does a fine job, but his wonderful accent and good looks are lost beneath the latex. I felt like they could have cast anyone for the role of Krall. 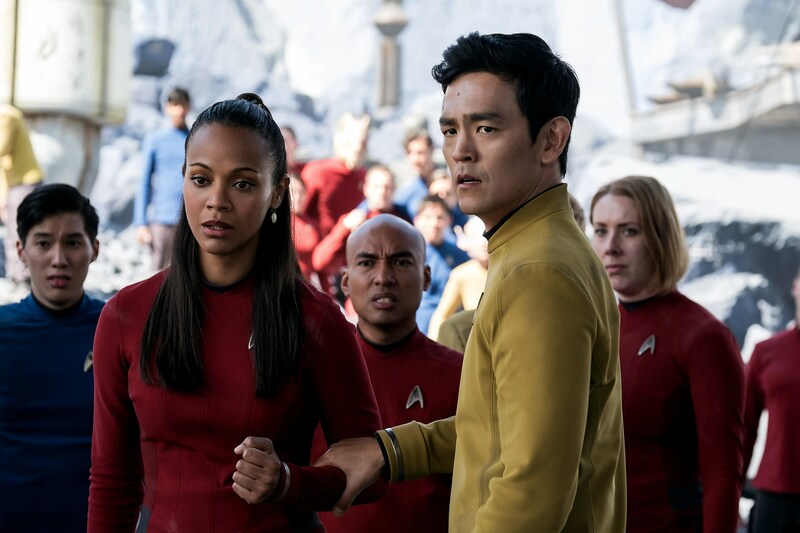 Uhura (Zoe Saldana) and Sulu (John Cho) in captivity with their crewmates. Scotty is able to avoid capture, by using an unconventional escape pod. On the planet he teams up with Jaylah, a new character who’s played by Sofia Boutella. She’s adept with engineering and the English language because she’s been living in a crashed Federation starship. The pair meet up with Kirk and Chekov and work at getting the crew back together. I really enjoyed Jaylah’s character. Simon Pegg has said during Star Trek Beyond’s press junkets that her character was inspired by Jennifer Lawrence‘s character from Winter’s Bone, and it shows. Despite a change in director, Star Trek Beyond is still a beautiful film to watch. Most of the movie was filmed in Vancouver, the first Star Trek movie to be filmed outside of Los Angeles. The introduction of the Starbase Yorktown is a sight to behold, especially in 3D. There have always been starbases in the Star Trek universe but none look as beautiful. The reveal is augmented by the score by Michael Giacchino, back for his third Trek movie. It was one of my favorite elements of the movie and I had a strong desire to listen to the album as soon as I left the theater. Thankfully it’s already available. A criticism of the Kelvin timeline films has been addressed in Star Trek Beyond. Uhura has been given more to do thankfully. She’s no longer regulated to a love interest of Spock who’s adept with language. She helps Kirk separate the saucer section, and doesn’t sit around waiting to be rescued. The rescue the damsel trope is subverted at the very last moment, which is great. Uhura is also the one who discovers Krall’s true identity. The only thing that didn’t quite work was the villain’s motivation.Krall has a vendetta against the Federation, and for the first two thirds of the movie it feels random and unfounded. Once his identity is revealed, in a nice callback Star Trek Enterprise, it makes some sense, but also comes off as too little too late. Neither Star Trek nor Star Trek Into Darkness had great villains so perhaps it’s a problem with the Kelvin timeline films in general. Overall, Star Trek Beyond is a great addition to the Star Trek universe and a fitting film for the franchise’s 50th anniversary. It captures the spirit of The Original Series much better than Star Trek Into Darkness. For the first time I was able to believe the bond between Kirk and Spock was as strong as their prime universe universe counterparts. I’d recommend it for both fans and non-fans alike. I saw it in IMAX & 3D! What a beautiful movie. Loved how it captured the essence and message of what TOS was. Something that was missing in “into Darkness”. There were a few moments that brought tears to my eyes. Great entertainment and well worth the extra $$ for IMAX/3D. Mmm disagree on Idris being the first well-known actor to be put under heavy make-up to play a villain – um Eric Bana anyone. While this movie was visually beautiful the best thing about it was the small things while the story was a bit of a combination of the first two the dialogue and interaction was brilliant and I loved the opening with Kirk disillusioned with the five year mission. It felt ordinary in an extra-ordinary world and made it somehow human and more accessible. Loved the one-on-one interaction – particularly between Bones and Spock! Some of the best lines in this one. Karl Urban stood out a little in this one (with just an eyebrow at times) – he’s always been great but I thought Uhura, Bones and the more “minor” crew members were really allowed to come into their own.